The foundation has coordinated to a special account all financial donations: its own and those from other legal entities and individuals. PRAVMIR. July 3, 2014. 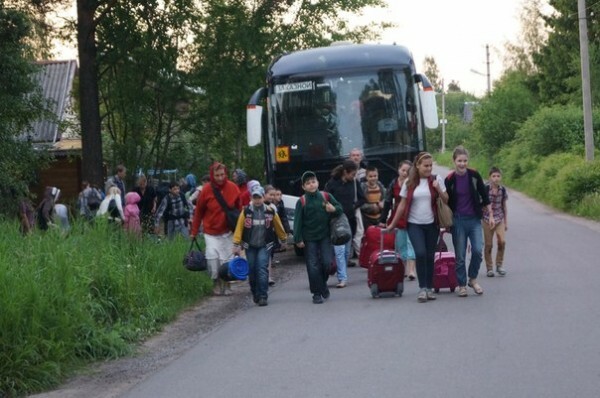 Refugees in buses from Kramatorsk, who were shelled last night at the Russian-Ukrainian border, are finally conveyed to the Vladimir region. The refugees’ transport was undertaken by the social organization, “Municipal Shield of Moscow,” with the financial support of the St. Basil the Great Charitable Foundation, the federal coordinator of fundraising to help the Donbass people. On June 9, the St. Basil the Great Foundation and the Council of Ministers of the Donetsk People’s Republic signed an agreement for the provision of humanitarian assistance to the Donbass population. In particular, the Foundation took upon itself the coordination of financial donations, its own and those from other legal entities and individuals, to a special account. The donations were intended for purchasing needed goods and to transport the Ukrainian refugees to safe areas. Meanwhile, as noted by the St. Basil the Great Foundation, following the end of the armistice in Ukraine, the number of refugees has continued to increase: “We constantly receive messages concerning hundreds of refugees waiting at the southeastern border of Ukraine. To the greatest possible extent, we will help convey them to a safe area. To date, we have reached an agreement with governors of 31 Russian regions to accommodate the Ukrainian refugees,” the Foundation explained.